College and Pre-Theology level seminary formation is all about laying strong and lasting foundations. At Saint John Vianney, building these foundations includes equipping young men discerning a call to the priesthood with the zeal and confidence they need to truly "meet people where they're at." This includes enabling all students (in both College and Pre-Theology Programs) to become comfortable communicating in both English and Spanish. With Philosophy and College-level Theology courses taught in both Spanish and English, seminarians do not only gain familiarity with both languages, they also gradually acquire the confidence and proficiency needed to eventually master one of the most important tools they need to be truly effective in their future ministry, most especially in a Church and society that are experiencing tremendous growth in diversity. The diversity of St. John Vianney's student body allows each seminarian to enter into a genuine encounter with those whose background is different from his own, and to experience first-hand and thereby appreciate and value, the catholicity of the Church. 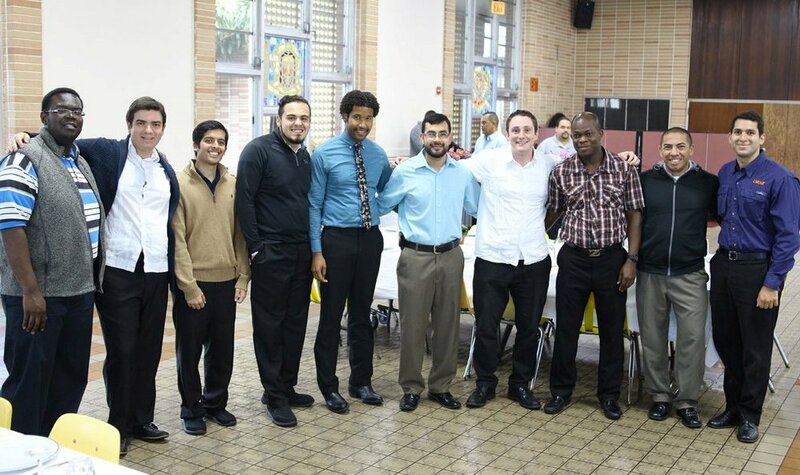 St. John Vianney's bilingual formation and education program is geared towards enabling each seminarian to become comfortable in both English as well as Spanish. While classes are taught in both languages, every student is assisted to grow in courage and willingness to step out of his linguistic and cultural zone of comfort. Thus, English-speaking seminarians who have gained a level of proficiency in Spanish sufficient enough to engage in philosophy and theology courses in it are encouraged to do so; similarly, Spanish-speakers who have become proficient in English do the same. Prayers and the Liturgy are also done in both English and Spanish. On Mondays, Wednesdays, Fridays as well as two Sundays each month, Mass and the Liturgy of the Hours are in English; Tuesdays, Thursdays, Saturdays and on the two other Sundays, in Spanish and, on select Sundays, Latin. Thus, the bilingual intellectual education each seminarian receives in the classroom is complemented and completed by the bilingual formation of the heart in prayer. The "why" of such an approach reaches far beyond the merely intellectual or academic and goes to the heart of what the Church teaches intellectual formation is meant to be in seminary: a preparation of the heart and mind for pastoral ministry, the formation of a future priest according to the heart and mind of Jesus the Good Shepherd. And at the very center of this formational and educational methodology is none other than a "sitting" at the Master's feet in order to grow as a disciple gradually being conformed to Christ who came "to serve and not to be served." The seminary's ESL program assists Spanish-speaking students in developing skills in English speech, comprehension, grammar, and writing. The sessions are designed to help students whose native language is not English gain a degree of confidence in communicating in English. In addition to systematic, traditional approaches, the sessions include conversation, immersion and other techniques to stimulate the language learning environment and prepare students to participate in mainstream content instruction. The Seminary's Spanish program aims to assist English-speaking students with the necessary skills to become comfortable understanding and communicating in Spanish - a skill necessary for those who are looking to one day minister to a Church and a society that is experiencing a tremendous degree of diversity. The Seminary's Accent Reduction Program is for seminarians who come to the United States with a sufficient knowledge and command of English but require assistance in improving oral communication skills that they will need for their future ministry. The program likewise welcomes clergy serving in a diocese in the United States whose bishop would like them to improve their oral communication skills for the sake of their ministry (of preaching) in a predominantly English-speaking parish. Beginning in Summer 2019, St. John Vianney will offer a program for non-Spanish speakers who wish to immerse themselves in an environment in which they can immediately put their basic knowledge of Spanish to use. Miami provides the perfect setting for those who would like to practice Spanish communication in a context that supports this endeavor.